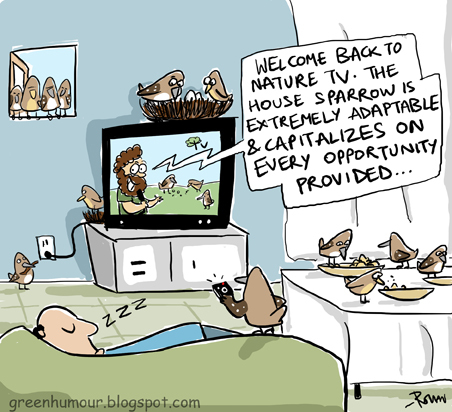 The most widespread passerine of the world, the sparrow personifies adaptability like no ther bird. It'll make as much a meal on the fruit trees in your backyard as in your trash bin. It'll make itself at home as much in the bird box as in an unused electric metre. Anything from waste cloth to discarded electric wires is nesting material for the sparrow. In spite of the alarming declines in sparrow populations, I consider myself extremely fortunate to have a home in a town that still harbours a healthy sparrow population, and to still be able to wake up to the chirps of the quintessential friendly neighborhood bird.